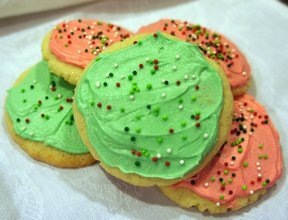 A soft and light sugar cookie sure to please. The almond extract adds a special touch. You could roll this dough out and cut out shapes. Add eggs, almond and vanilla flavorings. Chill dough, at least 2 hours, overnight works best. Roll dough into small balls. Place on baking sheet and press with a sugared glass bottom. Bake at 350° for approximately 8 minutes, depending on size and thickness. For frosting, blend powdered sugar, margarine, vanilla and milk until smooth and spreadable. 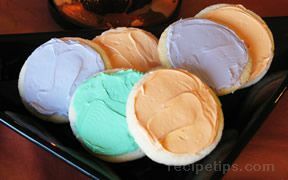 Frost and decorate cooled cookies. "My wife made these last night and I couldn't stop eating them. I even loved the frosting and I'm not big on frosting. 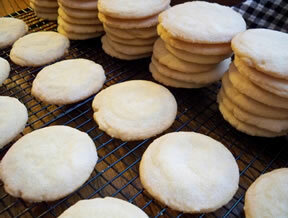 I liked these better than the crispy sugar cookies she usually bakes."